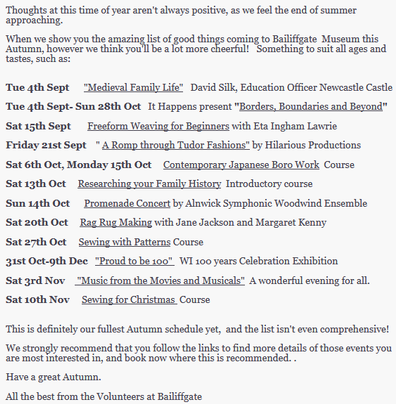 Bailiffgate Museum - Glanton Village Community Website. Northumberland. UK. 2018 is turning out to be a great year at Bailiffgate Museum. Following on from the fantastic Illustrating Harry Potter experience the museum has lined up an exciting programme of exhibitions and events to suit all ages and tastes. September welcomes textile group, It Happens,as they bring Borders, Boundaries and Beyond to Alnwick as part of their national tour. The final exhibition of 2018,Proud to be a 100,celebrates the local branches, of that much loved institution, the Women’s Institute. Eta Ingham Lawrie is running her usual Beginners’ Class runs in the autumn. Rag Rugging heroines Jane and Margaret return on Oct 20th. Check our website for details of these and our sewing classes.